Thinness never tasted so good! It is difficult to find treats that are yummy, healthy and low calorie all at the same time. Thins are a "Slice of Deliciousness". They are made with healthy ingredients like honey, Quinoa, and pumpkin, plus enriched with omega-3 fatty acids* and DHA*. 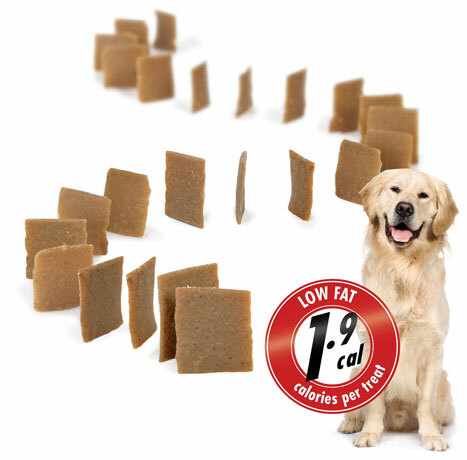 Best of all, Thins are only 1.9 calories each so you can reward your dog often knowing you are supporting their health…. and not their weight. Feeding Guidelines: Feed to your dog as a healthy treat or snack. Feed up to 10 treats for every 10 lbs of your dog's body weight per day. Not intended to replace your dog's regular diet. Always monitor your dog when giving treats. Make sure to have plenty of fresh water available at all times. Storage: Keep package sealed when not in use. Store at room temperature and away from heat.